A long, long time ago in a galaxy – well, actually, a City – far away, I was a police officer – a street cop. I witnessed some of the most horrific episodes of my life as I came upon scenes of automobile collisions with gruesome injuries. I also wrote my share of speeding tickets (and NO, I did NOT have a quota!) and arrested a fair number of drunk drivers. New technology, however, heralds the potential for an end to automobile collisions, speeding tickets, drunk driving and even most traffic management. Gee, there’s even the possibility that the traffic jam may be relegated to the dustbin of history (along with the dustbin itself, I might add). A combination of technologies is maturing which foretells such a future. The first one, of course, is the driverless car. Google has been at the forefront of prototyping that vehicle, to the point where California and Nevada have both passed laws explicitly allowing such vehicles on their roads. 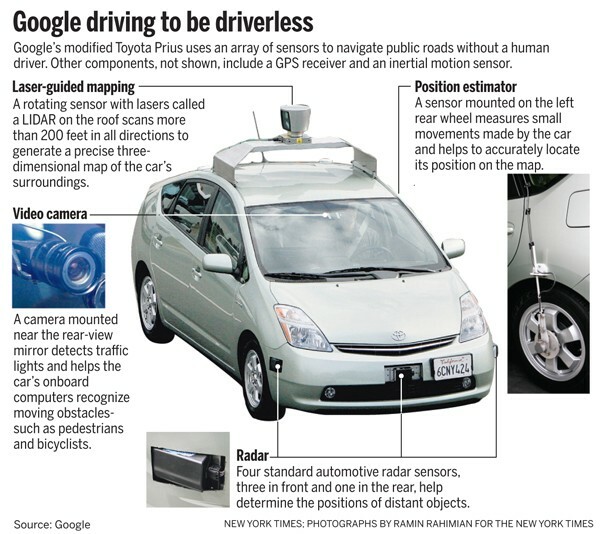 Beyond Google, most of the major automobile manufacturers are also testing driverless vehicles. And it’s only a matter of time before such vehicles are regularly driving our roads. Next, we are seeing the appearance of the “vehicle area network” and “networked vehicles”. I just purchased a new 2013 Toyota Prius C (and then promptly crashed it in a minor accident – subject matter for a different blog post). When I plugged my iPhone into the Prius to charge it, the Prius recognized the iPhone and linked to it, and offered the ability to use the iPhone’s cellular connection to link the Prius’ own touchscreen display, maps and apps to the wider world. Toyota also has an “entune” app for this purpose. We’ll see much more of this in the future – where cars are linked to the Internet. BMW already connects most of its vehicles worldwide to collect performance data via Teleservices. GM’s Onstar has been around for a number of years. Insurance companies are starting to offer discounts for good drivers who consent to put a monitoring device in their vehicle to sense sudden starts and stops, speeding, and other actions which may be dangerous (or at least insurance companies think are dangerous). Future vehicles will have networks which link the vehicle to all your personal devices – keys, smart phone, tablets, DVD players and more, to keep you “connected” and in control on the highway. Furthermore, cars will talk to each other. They could exchange location information, proximity information, directional information and much more. In this fashion cars might be able to avoid each other or allow for smooth lane changes and turns without colliding. A related development is the instrumentation of the highway. I had the privilege of working with the Seattle Transportation Department, which was at the forefront of intelligent transportation systems (ITS), when I was City CTO there. Today ITS means, for the most part, traffic sensing and detection devices to time traffic signals, extensive networks of traffic cameras linked with fiber cable, readerboards on streets, and some novel technologies like traffic time estimators and displays. Mobile apps are all the rage, of course, to display traffic conditions. Seattle just launched an amazing mobile app which actually shows live video from traffic cams on your smartphone. Indeed, the City of Los Angeles just became the first major City worldwide to automate all of its 4,500 traffic signals, synchronizing them. That will reduce travel times somewhat, although our experience with expansion of capacity (e.g. building new freeways or widening them) is just that more traffic is generated. But sensors and instrumentation can be taken a step further. Almost everything in the roadway could, of course, be instrumented – sensors in guard rails, school crosswalks, stop signs, bridges. Such sensors might not only collect information but also broadcast it to traffic management centers or, indeed, nearby vehicles. And you can see where this is leading – as cars become more “intelligent” with their own networks and sensors, and roads become more “intelligent” with their own sensors, networks and computers, the need for human drivers may become irrelevant. You could put your 3 year old alone in a vehicle, tell it to take her to daycare, and have it drop her off there and return home. Drunks (or their Washington-State modern day equivalents: pot smokers) could stumble into their cars and the vehicle would quickly and efficiently woosh them home – or to the detox ward, as the case may be, with almost zero chance of that drunk killing or maiming someone. 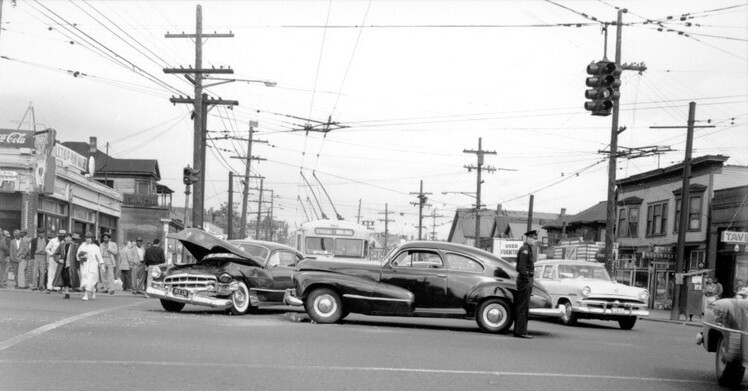 Speeding tickets, collisions, accident investigations, even automobile deaths might become history. As emergency vehicles speed to fires or crimes, traffic would autmagically stop and pull over – somewhat like the parting of the Red Sea – reducing response times for police and fire. Transportation departments would probably spend less time building new roads and widening existing ones, but high quality roads would be essential to prevent damage to vehicles driving at higher speeds. Many delivery jobs might be gone. Perhaps mailboxes would move to the curb (if not there already) and driverless Postal Service, UPS, FedEx and similar vehicles with robotic arms would just deposit most mail and packages in the box. This is a logical extension to today’s robot-filled Amazon warehouses. Of course how people are able to buy anything to be delivered, given all the job losses, is a separate issue! I don’t expect to see this traffic “nirvana” anytime soon. But I clearly see it on the horizon. Yes, there will be a lot of disruption and both loss of jobs and creation of new, unknown ones. But I welcome the day when grandparents are not killed and ripped from their families by drunk drivers. I hope to see over 36,000 Americans saved from needless death and 3.9 million from injury at the hands of automobiles and their drivers. The Seattle area and I just went through a four day snow/ice storm event. 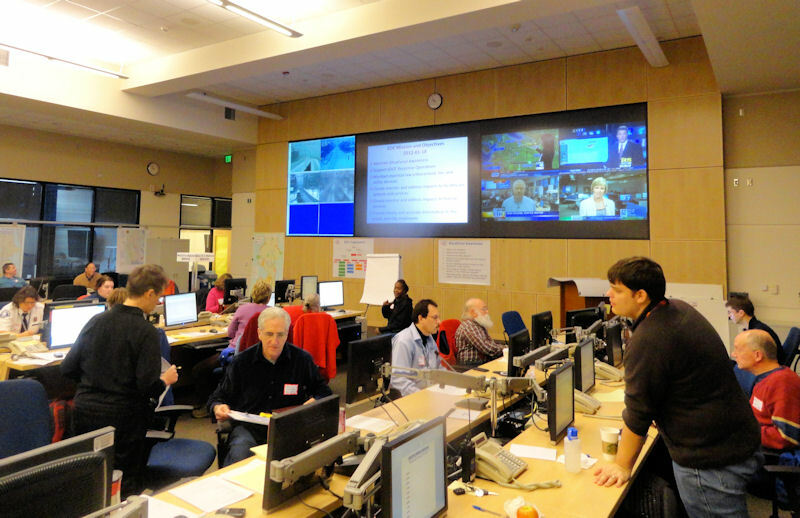 The City of Seattle’s emergency operations center (EOC) was activated and coordinated the City government’s response. That response received high marks from the public and media for a variety of reasons (see Seattle Times editorial here), including the leadership of Mayor Michael McGinn. I was able to personally observe that response and lead the technology support of it. Information technology materially contributed to the improved response, nevertheless I see a number of further potential enhancements using technology . And that’s the purpose of this blog entry. Every city, county and state is all about geography and maps. Maps are the way we deploy resources (think “snowplows”). Maps are the way we understand what’s happening in our jurisdiction. Everyone who has lived and traveled inside a city can look on a map and instantly visualize locations – what the “West Seattle bridge” or any other street, infrastructure or geographical feature (think “hill”) looks like. Another useful map is the electrical utility’s system status map, which shows the exact locations of electrical system outages, the number of outages, the number of customers affected and the estimated restoration times. This is really useful if you are a customer who is affected – at least you know we’ve received your problem and a crew will be on the way. What could we do better? We could put GPS on every City government vehicle and with every City crew and display all that information on a map. That way we’d immediately know the location of all our resources. If there was a significant problem – let’s say a downed tree blocking a road or trapping people – we could immediately dispatch the closest resources. In that case we’d typically dispatch a transportation department tree-clearing crew. But that crew might have to travel across the City when a parks department crew with the proper equipment might be a block away. This same sort of map could show a variety of other information – the location of police and fire units, which streets are closed due to steep hills and ice, where flooding is occurring, blocked storm drains, as well as water system and electrical outages. This “common operating picture”, across departments, would be enormously useful – as just one example, the fire department needs water to fight fires, and it needs good routes to get its apparatus to the fire and perhaps it would need a snowplow to clear a street as well. Obviously we wouldn’t want to show all of this information to the public – criminals would have a field day if they knew the location of police units! But a filtered view certainly could be presented to show the City government in action. A lot of media descended on Seattle this week. Partly that was due to the uniqueness of the storm – it doesn’t snow much in this City. And perhaps it was a slow news week in the world. A lot of news crews filmed inside the EOC. The Mayor and other key department spokespeople were readily available with information. This is quite important – the television, radio and print/blog media are really important in advising the public on actions they should take (“public transit to commute today, don’t drive”) and actions they should avoid (“don’t use a charcoal grill to cook when you are without power”). Our joint information center (JIC) was a great success. Mayor McGinn’s family even contributed to this – his 11 year old son filmed him in a public service announcement about how to clear a storm drain of snow and ice which is now posted on the Seattle Channel. What could we do better? We need better video conferencing technology, so the Mayor and senior leaders can be reached quickly by news media without sending a crew to the EOC. This video conferencing would also be quite useful in coordinating action plans between departments with leaders in different locations. In a larger, regional, disaster, such capability would allow the governor, mayors and county executives to rapidly and easily talk to each other to coordinate their work. It is much easier for anyone to communicate if they can see the visual cues of others on the call. Also, Seattle, like many cities, is a place of many languages and nationalities. We need to have translators available to get communications out in the languages our residents speak. This might include a volunteer-staffed translation team but at least could include recording and rapidly distributing written, video and audio/radio public service announcements in multiple languages. In these emergencies, many people elect to use public transit – buses and trains for commuting. (I actually took my “boat” – the water taxi – to work twice this week.) Yet snowstorms are also the times when buses jackknife or get stuck in snowdrifts and going up hills. In this emergency, the coordination between the transit agency (“Metro”) and the City was quite improved, because we had people – liaisons – from each agency embedded with the other. This allowed snowplows to help keep bus routes clear and help clear streets near trapped buses. And, with recent technology advances and sorta-broadband networks, many workers can now telecommute. 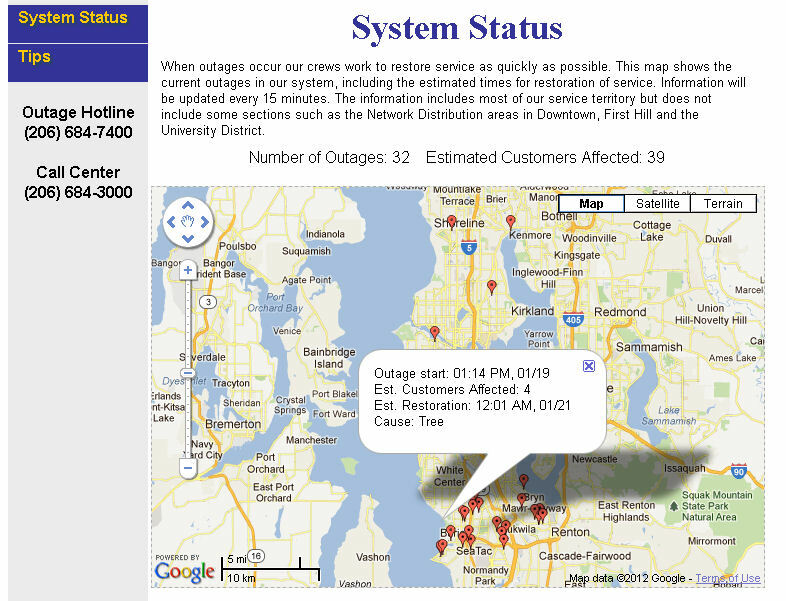 Seattle had few outages of Internet service this week, although in suburban areas trees and snow brought down not just power lines, but telephone and cable lines as well causing more widespread Internet issues. What could we do better? The easiest and most useful advance, I think, would be GPS on every bus and train and water taxi boat. That, combined with real-time mapping, would allow people to see the location of their rides right on their smartphones. If we deployed it right, such technology might also show how full the bus is and the locations of stuck buses. This sort of technology would be useful every day for public transit users – but is especially important during snow emergencies. Another huge necessity – which I’ve advocated often and loudly – is very high speed fiber broadband networks. With fiber broadband – and Gigabit (a billion bits per second), two way, telecommuting and tele-education becomes really possible. Kids could continue their school day with video classes even when schools are closed, you could visit your doctor, and of course citizens would have access to all that emergency information and maps described above, real time and two-way. I could go on and on about this – and I have – read it here. This area is the most ripe for improved technology to “weather the storm”. In any emergency – even a minor disaster like a major fire or a pile-up collision – just obtaining and distributing information early and often will have a significant result in managing the problem. On-duty at any time, the City of Seattle may have 200 firefighters, 350 police officers and several hundred to several thousand other employees. Yet we also have 600,000 people in the City, each one of which is a possible source of information. How could we get many of them, for example, to tell us the snow and ice conditions in their neighborhoods? Or perhaps to tell us of problems such as clogged storm drains or stuck vehicles? The Seattle Times actually did this a bit, crowdsourcing snow depths from Facebook. How can we “crowd source” such information? I’m not exactly sure. Perhaps we could use Facebook apps or Twitter (although not a lot of people use Twitter). Two-way text messages are possible. Any one of these solutions would present a whole mass of data which needs to be processed, tagged for reliability, and then presented as useful analytics. Eventually, of course, there will be whole armies of remote sensors (“the Internet of things”) to collect and report the information. Perhaps everyone’s cell phone might eventually be a data collector (yes, yes, I’m well aware of privacy concerns). In the meantime, we should have some way citizens can sign up for alerts about weather or other problems. 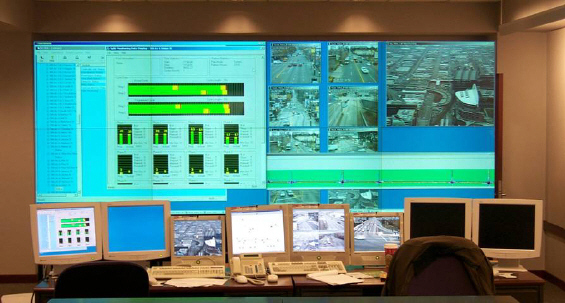 Many such systems exist, such as the GovDelivery-powered one used by King County Transportation. I’m not aware of such a system being used two-way, to crowd-source information from citizens. There are also plenty of community-notification or “Reverse 911” systems on the market. The Federal government is developing CMAS, which would automatically alert every cell phone / mobile device in a certain geographical area about an impending problem or disaster. Furthermore, during this Seattle snowstorm, many City of Seattle employees – including police and fire chiefs and department heads, used text messages on commercial cellular networks to communicate with their staff and field units. This continues a tradition of use of text messaging during emergency operations which first came to prominence during Hurricane Katrina. All of these solutions depend, of course, on reliable cellular networks. We know during disasters commercial cellular networks can easily be overloaded (example: 2011 Hurricane Irene), calls dropped and cell sites can drop out of service as power outages occur and backup batteries at the sites run out of juice. Yet, for people without power or land-line Internet, a smartphone with internet is a potential lifesaver and at least a link to the outside world. I’d like a way to easily collect this information – privately – from the carriers so emergency managers would know the geographies where mobile networks are impacted. This leads me, of course, to my final point – that we need a nationwide public safety wireless broadband network. Such a network would be built using spectrum the Congress and the FCC have set aside for this purpose. It would only be used by public safety, although – as our Seattle snowstorm underscored, “public safety” must be used broadly to include utilities, transportation and public works – even building departments. And it would be high speed and resilient, with 4G wireless technology and backup generators, hardened cell sites. These are a few of my thoughts on better management, through technology, of future snowstorms and other disasters, large and small, both daily and once-in-a-lifetime ones. What have I missed?